Laura Stevenson’s new album out of my head. Not the worst thing to ever happen to me. Laura Stevenson and the Cans new album, Sit Resist, on vinyl. It’s 11 dollars and comes with a free download of the album. And so far it is fantastic. You can buy it here. The two of these songs have such similar beginnings. with the Pomegranates. Very exciting. Laura Stevenson & the Cans released a download of their first single, entitled Master of Art. The new album, Sit and Resist, is being released April 26th. Download this song and enjoy! I need to buy the Laura Stevenson and the Cans re-release of A Record. Which has 3 songs added to it. Check it out here. New favorite Laura Stevenson and the Cans song ever. 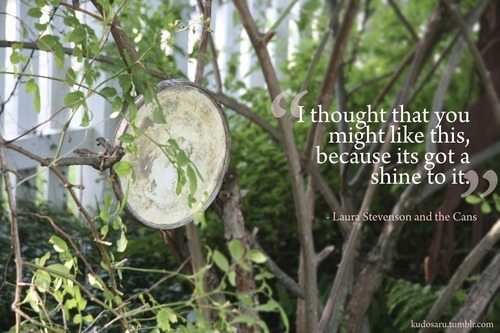 a line from my favorite Laura Stevenson song, A Shine to It, with a photo I took in my backyard. A Shine to It Laura Stevenson and the Cans Seriously great song. Check out the image I made for the song as well. Seriously great song. Check out the image I made for the song as well.